WHY – Sweating is a way to cool the body temperature whereby sweat glands in the skin are activated and release sweat. The evaporation of the sweat cools the body and those leftover sweat (on a humid day) leaves you soaked. See #SkinishMom post on sweaty occasions. HOW MUCH – We sweat different amounts on different occasions; for an hour of exercise, one can sweat from 0.8 to 1.4 liters. Excessive sweating is ‘defined’ in terms of the sweating deteriorating the quality of life, a condition known as hyperhidrosis. WHERE – This gets interesting as emotional sweating when you’re angry or anxious activate the sweat glands on the palms, soles and underarms! Sweating after eating spicy foods (gustatory sweating) are on the lips and forehead. WHAT – Sweat is made up of water, ammonia, urea, minerals (like sodium and magnesium), trace metals, lactate and various salts and amino acids. The exact composition of sweat varies depending on diet, genetics and activity level. Eccrine glands – All over the body in the dermis (layer after the outer epidermis of skin), there are over 2 million eccrine glands. The sweat exit via a pore. The sweat from eccrine glands has no smell of its own but the smell comes from bacteria on our skin feeding on the oils in the sweat. Apocrine sweat glands – At armpits and private parts, and the sweat exit via a hair follicle. Upon puberty, the glands make a thick, oily fluid which has a smell. Miliaria occurs under conditions of high heat and humidity that lead to excessive sweating. Occlusion of the skin from too much clothing or blankets can aggravate the pooling of sweat on the skin surface leading to over-hydration of the skin. In susceptible persons such as infants who have immature sweat glands, this often leads to transient blockage of the sweat ducts. Therefore, as more sweat is produced, there becomes and inability to secrete the sweat because of the blockage. As for sweat, the biggest problem is the irritancy of the sweat itself. The salts from sweat can crystalize and act as an irritant to the skin. If you can see that your baby’s sweat has dried and has a salty residue, then I would recommend rinsing it off with plain water (no soap) to prevent it from becoming an irritant. It could be one of these compounds, the combination of them, the changing pH of the skin, or even the sweat’s water content that can cause the itching and stinging sensations to some people with eczema. Eczema may also occur in those suffering from ichthyosis, a condition that has excessive skin scales, clogging sweat glands and preventing sweating normally. Pompholyx is another condition that some eczema sufferers also have, with a distinctive appearance of itchy small blisters on the palms of the hands. It is also more closely associated with excessive sweating and can be found on the soles and toes. 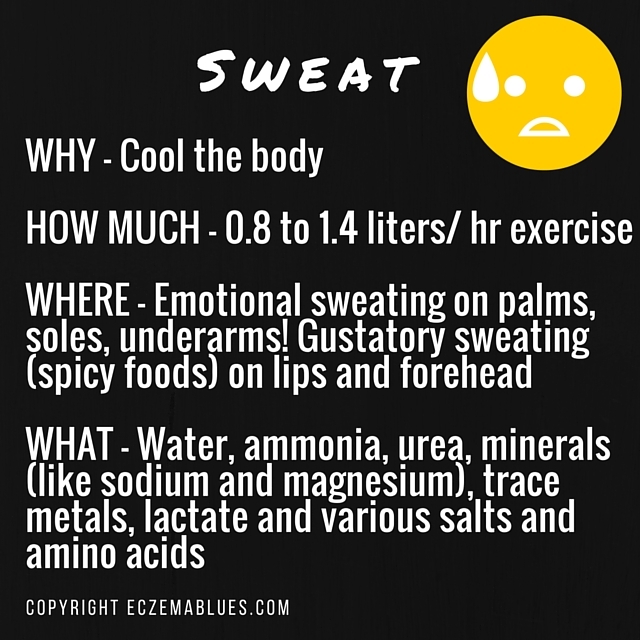 Chemistry.about.com – What Is the Chemical Composition of Human Sweat or Perspiration?